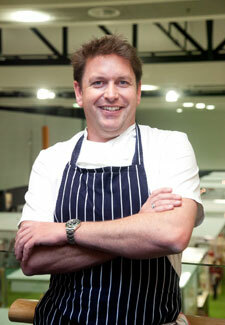 TV chef James Martin lets rip about Christmas! For most of us it’s the focal point of the Christmas Day feast and the subject of endless discussions about the best way to cook it. We’re talking turkey. And the host of BBC’s Saturday Kitchen, James Martin, says he can’t stand it. ‘Turkey is bloody awful,’ he tells us. ‘I’ve never been a fan of it. It’s always overcooked and dry and no amount of cranberry sauce or bread sauce makes it better. Instead, James will serve up roast beef and roast pork for his family at his Hampshire home – his first Christmas off duty, he reckons, for 23 years. But however much he detests it, the dreaded bird will find its way onto his dining table. ‘My mum is coming down from Yorkshire for Christmas, so I’ll have to do a little portion of roast turkey for her,’ he explains. ‘Otherwise she wouldn’t think it was a traditional Christmas. ‘Aaah!